Dr Sharon Johnson is a Registered Counsellor with the HPCSA. Sharon completed a Masters at Stellenbosch University working with teachers dealing with HIV/Aids in schools. Her Ph.D. examined interventions with teachers in high-risk schools using an evolutionary approach to brain health. Her Post-doctoral Fellowship research was in an education and care centre for behaviourally-challenged adolescents on the Cape Flats. She was awarded a prize at Stellenbosch University for completing her PhD in two years. 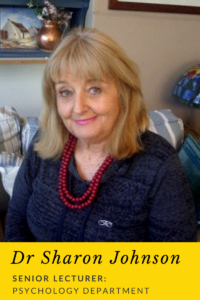 Sharon has been published internationally in academic books dealing with the care and education of high-risk children. She is busy completing her own book: Triumph over trauma and tribulation based on her post-doctoral research at the youth care and education centre. PLEASE NOTE THAT CPD POINTS IS WITH THE HEALTH PROFESSIONS COUNCIL OF SOUTH AFRICA (HPCSA). Spaces are limited please book early to avoid disappointment, for further information email: marykan@cornerstone.ac.za or call her at (021) 448 0050 ext. 2229. What is a trauma and resiliency informed school? Costs: The registration fee for the workshop is R800 pp. person. Light Lunch and refreshments will be served (Cornerstone students pay a discounted fee).